America s fascination with Pearl Harbor is undying, and nowhere is it more evident in film. In the 60 years since that fateful day in 1941, scores of movies have featured in the infamous landmark. 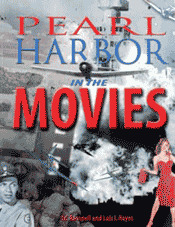 Pearl Harbor in the Movies is a pictorial history of those movies, bringing them to life frame by frame. Just in time for the upcoming blockbuster Pearl Harbor, this eye-pleaser is sure to be a new favorite.